Cathedral of Siena, in the early 1800s. Private collection, Tuscany; Alexander Barker [d. 1873], London and Florence; Paul Pavlovich Demidoff [1839-1885], prince of San Donato, near Florence; (his sale, Florence, 15 March-10 April 1880, no. 368, as La Vierge aux Roses by Parri Spinelli). L. Ganetiez, Paris; (sale, Christie, Manson & Woods, London, 13 July 1889, no. 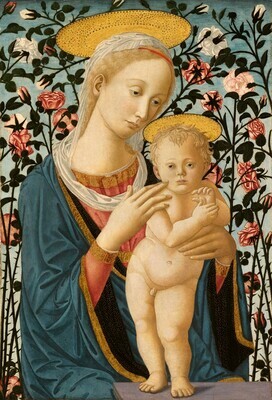 65, as The Madonna with the Infant Savior, with roses in the background by Parri Spinelli); (Ellis). (Leo Nardus [1868-1955], Suresnes, France, and New York); sold 1898 to Peter A.B. Widener, Lynnewood Hall, Elkins Park, Pennsylvania; inheritance from Estate of Peter A.B. Widener by gift through power of appointment of Joseph E. Widener, Elkins Park; gift 1942 to NGA. René Ménard, "Spinello Aretino," Gazette des Beaux-Arts 9 (February 1874): 118, 119, includes an engraving identical in every detail to the Gallery's painting and writes that the painting "Provient de la cathédral de Sienne, où elle était encore sous la Restauration" ("comes from the cathedral of Sienna, where it was still under the Restoration"). When the panel entered or left the cathedral, or under what circumstances, is unknown. It is unlikely that the cathedral would have been its original location, given the painting's private devotional function. According to the Demidoff sale catalogue, where the 1874 engraving reappears, Barker acquired the painting from one of the oldest patrician families in Tuscany. The name of the consigner to the 1889 sale was kindly provided by Jeremy Rex-Parkes, Christie's Archives, London. The buyer is given in a newspaper article added to the Knoedler microfiche copy of the 1889 sale catalogue. Early Widener collection records (in NGA curatorial files) indicate that the painting was acquired from Nardus in 1898 but do not mention prior provenance. An article in an April-June 1902 readers' forum in Les Arts invited discussion of the quality and attribution of a painting in an unnamed collection visually indistinguishable from NGA 1942.9.50. One Paris respondent noted that the Widener [NGA] painting was identical to the one reproduced, but it is reasonable to assume that the painting reproduced in Les Arts was actually the Widener painting. Berenson then connected the Barker painting to the one in the Widener collection in his 1916 Widener collection catalogue. The Flowering of Florence, National Gallery of Art, Washington, D.C., 2002, no. 2, repro. Berenson, Bernard, and William Roberts. Pictures in the Collection of P.A.B. Widener at Lynnewood Hall, Elkins Park, Pennsylvania: Early Italian and Spanish Schools. Philadelphia, 1916: unpaginated, repro., as by Pier Francesco Fiorentino. Paintings in the Collection of Joseph Widener at Lynnewood Hall. Intro. by Wilhelm R. Valentiner. Elkins Park, Pennsylvania, 1923: unpaginated, repro., as by Pier Francesco Fiorentino. Paintings in the Collection of Joseph Widener at Lynnewood Hall. Intro. by Wilhelm R. Valentiner. Elkins Park, Pennsylvania, 1931: 152, repro., as by Pier Francesco Fiorentino. Works of Art from the Widener Collection. Foreword by David Finley and John Walker. National Gallery of Art, Washington, 1942: 6, as by Pier Francesco Fiorentino. Paintings and Sculpture from the Widener Collection. National Gallery of Art, Washington, 1948 (reprinted 1959): 6, repro., as by Pier Francesco Fiorentino. Summary Catalogue of European Paintings and Sculpture. National Gallery of Art, Washington, 1965: 102. European Paintings and Sculpture, Illustrations. National Gallery of Art, Washington, 1968: 90, repro. European Paintings: An Illustrated Summary Catalogue. National Gallery of Art, Washington, 1975: 268, repro. Shapley, Fern Rusk. Catalogue of the Italian Paintings. 2 vols. National Gallery of Art, Washington, 1979: I:266-267, II:pl. 182, as Lippi-Pesellino Imitator. European Paintings: An Illustrated Catalogue. National Gallery of Art, Washington, 1985: 311, repro. Boskovits, Miklós, and David Alan Brown, et al. Italian Paintings of the Fifteenth Century. The Systematic Catalogue of the National Gallery of Art. Washington, D.C., 2003: 416-421, color repro. Langhanke, Birgit. Die Madonnenreliefs im Werk von Antonio Rossellino. Ph.D. diss. Ludwig-Maximilians-Universität, Munich, 2013: 488 fig. 146.